The AJA Ki Pro Rack is a tapeless, file-based video recorder that captures and records in ready-to-edit ProRes and DNxHD codecs, in 10-bit 4:2:2 full-raster files, and onto HDD or SSD storage modules (sold separately). 10-bit 4:2:2 color depth provides superior dynamic range, original picture representation, and flexibility in adjusting color and balance in post. Two slots are available for the storage modules. 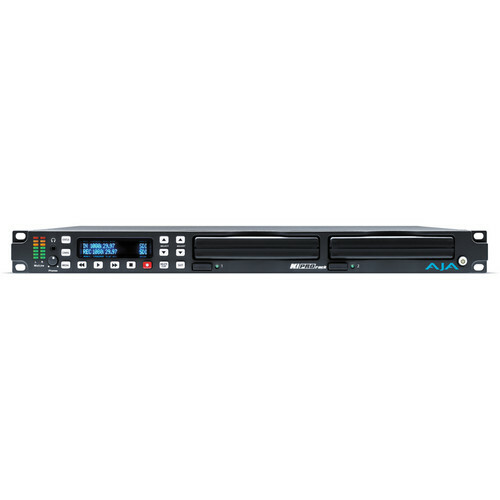 Ki Pro features RS-422 control for integrating with editing systems, external controllers, and with tape decks (to capture tape-based media as ProRes). Also by RS-422, assemble edits can be sent direct to storage modules, often faster than rendering to ProRes or DNxHD. The panel controls are for the most part identical to those of tape decks. The display screen and operating system work hand-in-hand to facilitate full configuration without any connection to a separate computer: all information is displayed clearly on the screen and the OS control menu is a fast and flat one. The set of connections is diverse and includes video and audio ports that are the same kind as those of tape decks. Accordingly, the Ki Pro is compatible with the cabling and routing systems used with tape decks. Also available is an Ethernet port by which files can be transferred (minimizing the need for staff involvement and allowing better employment of staff). Up/down/cross conversion can be performed right inside the hardware, both during recording or playback. A second device won't be needed for conversions. As for remote control, the Ki Pro can be fully configured and controlled via a web browser per an IP address assignment. Multiple Ki Pro Racks can be networked together for control over a single interface. Box Dimensions (LxWxH) 21.3 x 18.6 x 7.8"
Ki Pro Rack is rated 4.3 out of 5 by 4. Rated 4 out of 5 by Matt from Reliable recording device We use this device to record our church services every week. The ability to record directly into ProRes is great for editing on the backend. We love being able to access it through our network and pull files over to my editing rig without having to pull the drives (although even that is really easy to do with the Firewire 800 jack on the back of the hard drive modules). We also just discovered that the unit accepts custom API, which allows us to schedule recordings on the device through iCal which triggers start/stop through the network. I agree with the other review that it is unfortunate that recording stops when the drive gets down to 10% capacity. And it's also annoying that it doesnt automatically switch over to the other drive. It would be great if there were more options here; like the ability to automatically switch to the other drive or the ability to write to both drives simultaneously for redundancy. Rated 3 out of 5 by Waco from Solid Recorder with a Couple of Flaws We use the Ki Pro Rack in our live production truck, mainly for recording sports, but really anything that needs multi-cam. The Ki Pro Rack does a great job of recording into a very usable and clean Pro Res format for us. It's solid, and we've never had a problem with lost media or failed drives. The only problem that I have with the unit comes into play when a drive starts to get full. Basically, recording stops when a drive gets down to 10% empty space, which for a 250GB drive means about 25GB of remaining space. Depending on your format chosen, 25 gigs can be over an hour of recording in SD 525 or around 20 minutes of 1080i60 footage. To me, that's a lot of left over storage space that is really needed. The reason that left over space is crucial is because even with 2 hard drive slots, the Ki Pro Rack DOES NOT AUTOMATICALLY switch over to the second drive when the first gets down to 10%. This is a major flaw in my opinion. To switch to the 2nd drive, you have to first stop recording, hit slot, select drive #2, and start recording again. Basically, if you're in the middle of a live shoot, you have to cross your fingers that you don't miss anything while switching drives. Again, this is a great unit overall, but not being able to have an auto switch between slots is a crucial flaw. It would also be nice to simultaneously record to both drives at once, either in 2 different formats (1 HD, 1 SD) or as a redundant backup. Without a larger hard drive than the 250GB, it starts to get hard to record long multicam events in hi-res environments. Example: 1080i60 event that lasts 3 hours comes to ABOUT 70 gigs per hour = 210GB. You come pretty close to the 10% threshold right there, and if you go much longer you may get hosed. Just something to think about when considering this unit. Rated 5 out of 5 by farmboyENG from Very Reliable We record 6-8 hours of content ever day. We work these units very hard, and they keep on working. Rated 5 out of 5 by Brad from Solid I love these rack units. We have 5 of these now for different production spaces and theyve always been rock solid. Can the Ki Pro Rack record two separate inputs simultaneously? I might be missing it but where does it say what format this records in I see ProRes and DNxHD but is that in: MXF, mov, mp4, mpg? Hi Peter, It will record .mov files using either ProRes or DNxHD codecs. The Aja Ki Pro Rack includes a 3-Year International Warranty. can I record to both slot 1 and slot 2 drives simultaneously? ?